The Center for Intellectual Property Understanding (CIPU) is an independent, non-profit organization the helps to raise awareness of intellectual property rights and how they impact people’s lives. 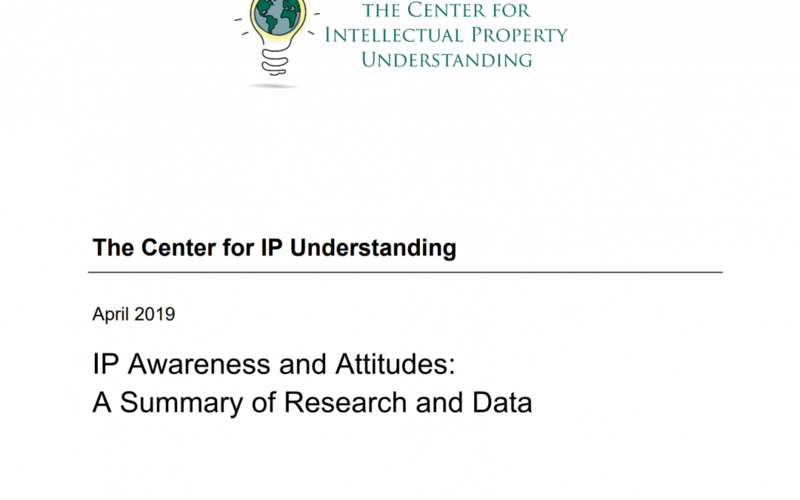 The latest CIPU Report – “IP Awareness and Attitudes: A Summary of Research and Data” was published in April 2019. This CIPU report was commissioned to quantify the current state of IP understanding, in an attempt to understand whether understanding has moved beyond basic awareness. It found significant basic awareness of IP and the importance of respecting it. But low understanding of WHY IP is important, which impacts negatively on small businesses, students, and consumers. The report concludes that copyright is better understood than patents, and suggests ‘bundling’ patent-related issues with discussions of copyright and trade mark protection. It also concludes that both education levels and age affect an individual’s understanding of IP. Which suggests that efforts to reach school and higher education students may be more successful than IP programmes for the general public. It endorses some common perceptions, including that IP only benefits large corporations, consumers have little awareness of the benefits that strong, enforceable IP rights provide, and that the public is misinformed about IP. The report recommends making IP topics more relatable to individual contexts, disseminating IP information more widely, and keeping the costs of interacting with IP system low.